Because prior studies of American women’s travel writing have focused exclusively on middle-class and wealthy travelers, it has been difficult to assess the genre and its participants holistically. Lorenza Stevens Berbineau’s diary provides readers with the unique perspective of a domestic servant in the wealthy Lowell family in Boston. Staying in luxurious hotels and caring for her young charge Eddie during her six-month grand tour, Berbineau wrote detailed, incisive entries. Contributing to the traditions of women’s, diary, and travel literature from the perspective of a domestic servant, Berbineau’s diary reveals an arresting, intimate outlook on her own life and the activities, places, and people she encounters. She records Europeans’ religious practices, working people and their behavior, and each region’s aesthetic qualities. Clearly writing hastily and with a pleasing freedom from the constraints of orthographic and stylistic convention, Berbineau offers a distinctive voice and a discerning perspective. Alert to nuances of social class, her narrative is as appealing and informative to today’s readers as it no doubt was to her fellow domestics in the Lowell household. 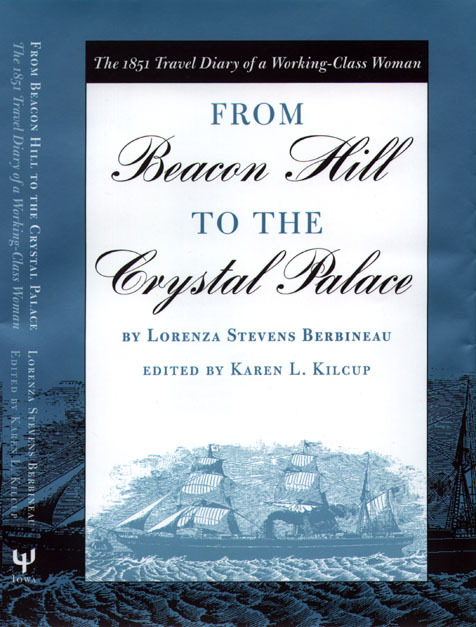 Unobtrusively edited to retain the individuality of the author’s original manuscript, From Beacon Hill to the Crystal Palace offers readers brief framing summaries, informative endnotes, and a substantial introduction that analyzes Berbineau’s narrative in relation to gender and class issues and compares it to the published travel writing of her famous contemporary, Harriet Beecher Stowe.